To grow your business you need a strong, unique brand that people remember. Seems obvious, right? I mean who wants a weak, same old-same old brand that nobody remembers? Exactly! And yet, I am still amazed by how many business owners I talk to that don’t take the time to nail down their brand and craft messages that really resonate with their customers. Marketing and especially brand strategy always seem to fall to the end of the investment list. But if you want to attract new clients the investment is needed. It is imperative to have a unique and memorable brand these days. Why? Because there is so much information, so much clutter, distracting potential clients from hearing about how you can solve their problem. If your potential customers don’t hear about you, then they will never consider you. It’s as if you don’t exist. I have business owners tell me that they don’t have the budget to create a brand strategy but they want go ahead and update their website. Without nailing down the brand messaging – what you do, who you do it for, and how you uniquely do it better than anyone else – your website or any marketing tactic won’t attract the customers you want and it certainly won’t get them to act or remember you later. You’ll also be wasting your valuable money. If I have convinced you that you need a strong, unique brand that people remember then go ahead and read on. 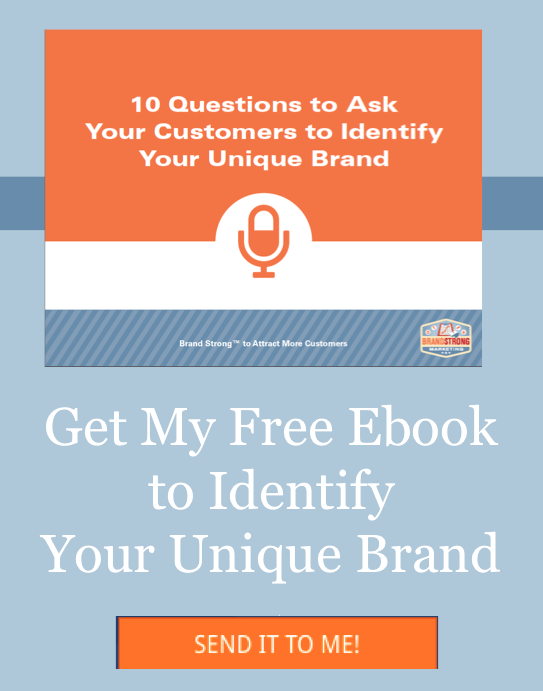 In the past 15 years I have taken a lot of clients, large and small, through a Brand Differentiating Process to help them identify how their business is unique, which customer segments value that uniqueness, and then how to tell their brand story in a way that helps them stand out and be memorable. I like to say they Brand Strong™. I want to share that process with you because I want to help you grow. See your business succeed. Attract the right customers. Make your life easier. I’m a fellow business owner. I love helping other businesses grow and especially helping business owners discover their brand, their uniqueness. 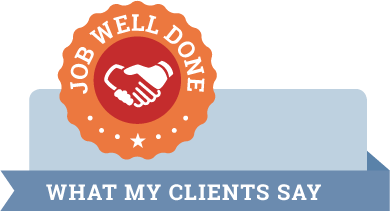 For me, there is nothing cooler than seeing a business owner swell up with pride and even relief when we identify the value their business offers and validate why that is unique. I know that having a strong brand offers a tremendous amount of value not just to the business but to the business owner and employees. So let’s get to the Brand Differentiating Process. There are four steps involved. Some steps take a little more time than others. Let me start by saying the process is not hard, but it takes work. The reason I named my company Brand Strong Marketing is that for me brand building is a lot like exercising. It is a never ending process. It takes time and hard work to achieve your goals but you can’t stop. 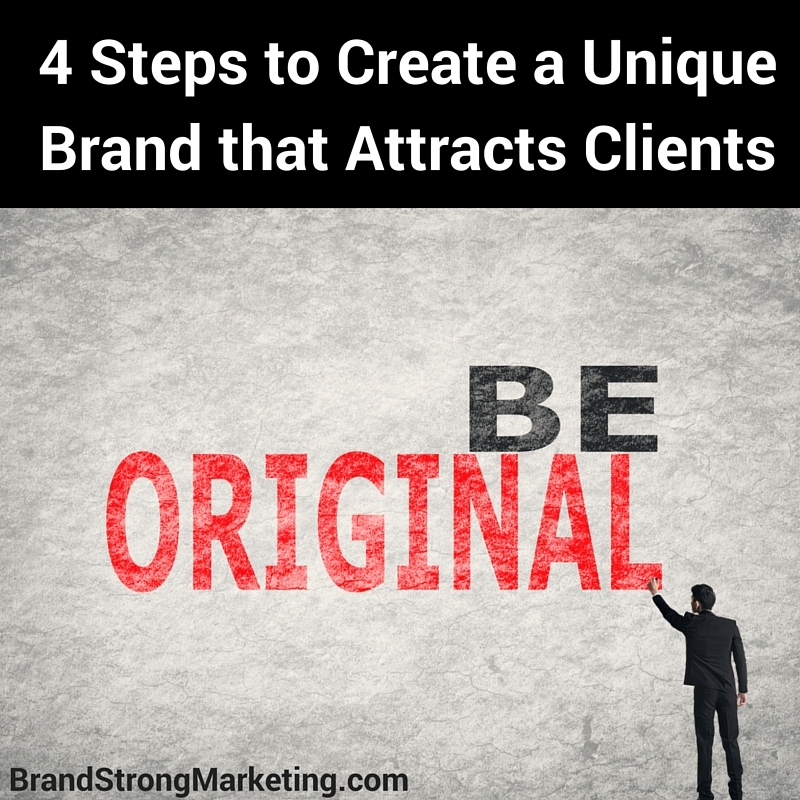 You need to keep “working out” to maintain a strong brand. For some people the process is easier and more enjoyable than it is for others. (Just like exercising!) But, it’s worth it! Seeing your business grow is SOOO worth it. Let me also say that your company is unique. Don’t panic if it doesn’t come to you right away. You just might have to dig a little deeper and look at all aspects of your business to see where you do things differently from your competitors. Step 1 – Know thyself. You need to really look at yourself to identify how you are unique. Identify your core values, personality, mission, and vision. Then take a look at your process. What steps do you take to deliver your product or service. It is important to outline the process and identify every touch point you have with your customers. It’s important for two reasons. First, you may find that they way you do something is unique or different from the competition. Second, you may see opportunities in the process to add or strengthen a differentiator. To get the best results here, it will be important to interview your customers. You need to “See Yourself as Others See You” in order to identify what you do differently that your customers value. Step 2 – Know your customer better than they know themselves. It’s more than just understanding their business wants and needs. You need to dig a little and do the research to develop a Target Market Persona or Buyer Persona that helps you see what drives your customers as people. What do they like, where do they hang out, what keeps them up at night, and what would make them look like a hero. Even in Business to Business situations, there is a human who is going to decide whether to work with you or not. Get to know these people! Step 3 – Choose a position and validate it. So now that you know what your company offers and what your customers want, it is time to marry all of that information together and claim your unique position in the marketplace. What does that mean? Positioning was popularized by Al Reis and Jack Trout in their bestselling book Positioning: The Battle for Your Mind. The idea behind positioning is to identify and attempt to “own” a market niche for a brand, product, or service using various strategies beyond just advertising like pricing, distribution, packaging, and process. The goal behind positioning is to create a strong, unique impression in the customer’s mind about what your company stands for that is distinct in the marketplace. Once you have decided on a position (or positions)that fits with your brand and is attractive to your target market, you need to evaluate and validate them. There are a variety of techniques to help you do that. You’ve made it this far with a lot of research, soul searching, strategic thinking, and validation. Now it’s time for the fun part. Building a brand is more than just advertising. It is the culmination of communication and experience that a person has with your brand. What can you say, how can you act, and what can you deliver to stand out from the competition and resonate with your target market? This is where you take a look at your brand messages and figure out a way to communicate it creatively so that it stands out and is memorable. You also look at every touch point of your business and see if there are opportunities to strengthen your brand with little tweaks that will reinforce your brand message. Is your brand story compelling? Is the customer experience memorable? That is the process in a nutshell. Now that you know what you need to do, I am going to elaborate on each of these steps to tell you how. If you don’t want to wait for the explanations or you want some additional guidance and feedback through the process, please join me when I conduct my new workshop How to Create a Unique and Memorable Brand that Attracts Clients on April 28th. I’d love to help you so if you are in the Chicago area, click here to get the details.